A nearly year-long campaign led by CWA has produced a big safety and health victory for AT&T technicians. CWA District 9 staff – joined by CWAers in District 3, 4, 6 and the Telecommunications and Technologies sector – pressed AT&T to replace the 100 percent synthetic uniforms it required technicians to wear, among other unsafe conditions. CWA District 9 and Locals 9416 and 9431 filed complaints with the California Occupational Safety and Health Administration (Cal-OSHA), and following a comprehensive investigation, three serious citations and three general citations were issued on Dec. 5, regarding electrical safety, telecommunications safety and personal protective devices, and heat illness prevention. The uniforms were considered a serious citation, and technicians now can wear other branded clothing and will not be required to wear synthetic shirts that are highly flammable. U-Verse technicians who perform their work in close proximity to high and low voltage electrical energy are exposed to arc flashes that can ignite the clothing causing serious burns, injury, and possibly death to the technician. Cal-OSHA found that AT&T did not provide workers with proper tools to detect electrical current, nor did it have in place a plan to mitigate heat-related injuries. The agency levied $65,195 in penalties against AT&T. Last Friday, D9 AT&T West members held actions in California and Nevada to focus public attention on how AT&T’s greed hurts customers, workers and communities. CWAers gathered on major highway overpasses and unfurled banners and signs calling for fairness at AT&T. CWA represents about 15,000 workers at AT&T West, and CWAers are mobilizing for a fair contract. 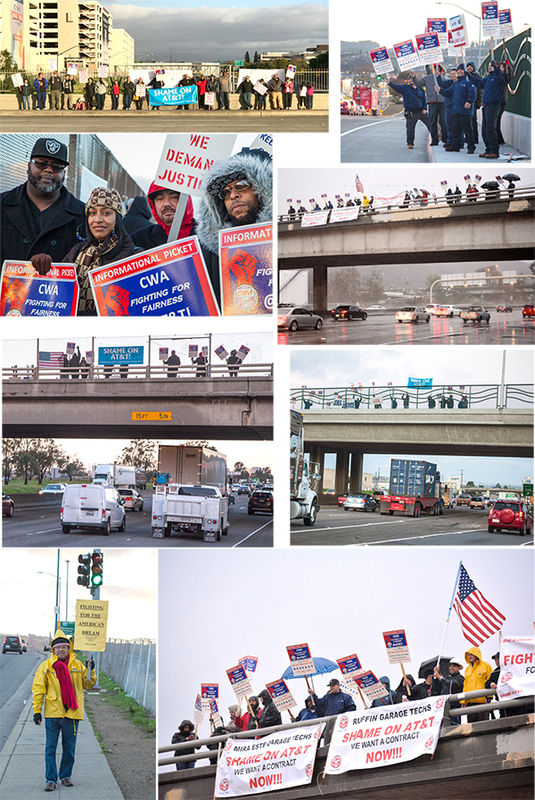 CWAers from Locals 9404, 9410, 9412, 9415, 9509 and 9510 mobilized on highway overpasses at several locations in California and Nevada, getting the message out loud and clear: AT&T's greed hurts workers, customers, and communities.